Pre-Sold Out: Coming in April 2019 (details) Pre-Sold Out: estimated to ship in April 2019 (estimated date / subject to change). Aquaman as an ArtFX statue! Straight from the The New 52 comic book series. Arthur Curry stands 8-inches tall on his Justice League display base. Super-detailed Aquaman in a commanding pose! As popular as he is critically acclaimed in the pages of the Aquaman comic book series from The New 52, Aquaman is represented with fantastic detail in this Aquaman New 52 ArtFX Statue. Arthur Curry's alter ego stands 8-inches tall in ArtFX 1:10 scale, sculpted by master artist Guotaro Takeuchi. Aquaman's iconic costume is captured in fine detail, from the intricate overlapping scales of his metallic-orange armor to the creases and pointed fins on his green pants and gloves. The muscular aquatic hero holds his mighty trident in his right hand, calmly staring down the threats before him from under his wavy blonde hair. Like the other Justice League members, the Aquaman New 52 ArtFX Statue has magnets in its feet for stability on the included display base. 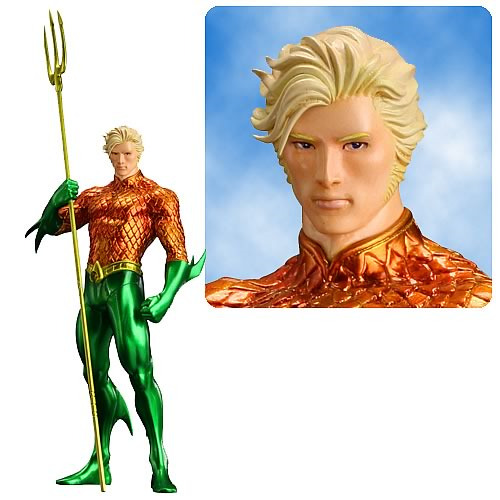 Aquaman will look mighty fine displayed alone on your shelf or alongside his teammates (sold separately). Ages 14 and up.